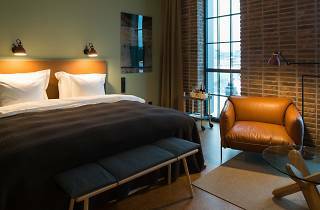 Ideal for a staycation or soaking in the New York vibe without having to go all the way there, The Winery Hotel allows guests to follow the winemaking process from barrel to bottle. Sink into comfy leather chairs for a relaxed tasting at the bar or enjoy panoramic views—glass of the hotel’s own wine in hand—from the rooftop terrace’s heated pool. 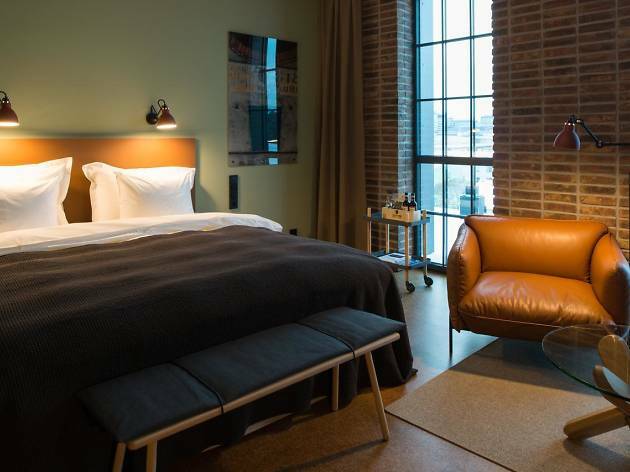 All 184 guest rooms share an industrial factory-like feel with exposed brick walls, high ceilings and windows and brass accents; standard, superior and deluxe configurations are available, and all include complimentary breakfast. Packages include guided tours of the on-site winery, tastings and multiple-course dinners; daily activities planned by the hotel’s expert sommeliers could involve learning how to open a champagne bottle with a saber or indulging in a kundalini yoga and wine session. The on-site restaurant and deli sources local, seasonal ingredients, while the fitness centre could come in handy later for working off all the (liquid) calories. Located just outside of Stockholm, near the Arlanda airport, Solna is home to Sweden’s new football stadium–Friends Arena–as well as the largest shopping centre in all of Scandinavia. 1. Mall of Scandinavia: To shop while you drop in the largest shopping centre in Scandinavia. 2. Swedish Museum of Natural History: For rainy-day, family-friendly learning activities. 3. Hagaparken: For a leisurely lakeside stroll. Book a room above the third floor for views of the nearby lake.